I have recently visited a number of museums and private car collections and the thought crossed my mind; “If I had the money what would I buy?” It is a very difficult answer because so much depends on how much money you have and what you want to do with the cars. We all have different levels of financial resources and like different cars. Some of us want to drive them others just want to look at them and still others aren’t happy unless they are working on them. For sometime now there have been Fantasy Pro Sports, Fantasy NASCAR etc. I think it is time for some Fantasy Car Collecting! So here is the deal. Pretend you have $500,000 dollars from a good pull on a slot machine in Vegas. The taxes are paid and you have a terrific spouse that says buy cars with it. We are also going to assume that you have a place to store them, insurance is not an issue and you can afford the gas. There are only a couple of rules just to keep it fun. First, you have to buy at least 5 cars and no more than 10. None of the cars can be newer than 1972. You pick the cars and you set the prices, they have to be reasonable but it is understood condition and options make a difference. Make your list and email them to me at Richard@LegendaryCollectorCars.com. I will post the best ones. I will also try to keep track of the particular cars that are selected most often. If possible I will try to create a list of the readers Top Ten Collector Cars. There is nothing to win just a chance to have some fun and share your ideas with other readers of Legendary Collector Cars blogs. Who knows maybe we can start a Fantasy Used Collector Car Lot on the web and start swapping, buying and selling virtual collector cars! If you are having trouble getting started, I will kick it off with my own top 10 collector cars for $500,000. My list is based on variety, favorite cars and a desire to have at least one example from every decade from the 1930’s to the 1970’s. The list is in no particular order other than how they popped into my head. 1. 1932 Ford three window, full fender hot rod (California Kid Style); $50,000. 2. 1940 Ford Coupe hot rod, old school hot rod, dropped axel, black with red wheels and chrome centers with trim rings and a hot flat head; $45,000. 3. 1957 Corvette, all original with turquoise and white coves, 4 speed; $75,000. 4. 1967 Mustang Fastback, mild restomod, looks like a GT 350 in black with gold stripes, $40,000. 5. 1970 Z28 Camaro, all stock in Hugger Orange with white stripes and 4 speed, $40,000. 6. 1953 Studebaker coupe, restomod powered by Corvette and painted burgundy, $35,000. 7. 1970 AAR Cuda, all original and painted in yellow, $75,000. 8. 1964 Pontiac GTO tri-power, all original, 4 speed, black, $65,000. 9. 1969 Ford Talladega, the big 428 CJ in Maroon, $55,000. 10. 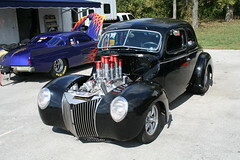 1936 Ford original dirt track race car converted to street legal use, $20,000.